WARSAW, Poland (CNS) — A Lithuanian archbishop who was murdered with a lethal injection after 16 years in prisons and labor camps was to become the first Catholic martyr from the country’s communist era to be declared blessed. The beatification ceremony for Archbishop Teofilius Matulionis, who died in 1962, was planned for June 25 in Vilnius, the Lithuanian capital. About 30,000 people including bishops and priests from abroad were expected to attend. “Besides being our first Soviet-era martyr recognized by the universal church, he’ll also be the first Lithuanian beatified on native soil,” said Archbishop Gintaras Grusas of Vilnius, president of Lithuania’s bishops’ conference. Archbishop Matulionis’ “radical belief” in “seeking the truth at any cost” offered an attractive message, especially for young people, who will take part in a two-day youth festival before the ceremony, the prelate told Catholic News Service June 8. “Given current tensions in our part of the world, his call to remain at peace and follow the divine will, knowing God always gives us the gifts we need, remains highly relevant,” Archbishop Grusas said. “Witnessing to one’s faith doesn’t necessarily mean going as far as death. There are also lighter forms of persecution happening daily in our societies, which it also requires courage to face,” he said. Born in 1873 in Kudoriskis in northeastern Lithuania, Archbishop Matulionis was ordained in St. Petersburg, Russia, in 1900, and took charge of the city’s St. Catherine Church in 1910 after parish work in neighboring Latvia. Jailed for three years during the 1923 trial of Archbishop Jan Cieplak and other Catholic clergy, he was secretly made a bishop six years later following his release, but then sent without trial to the Solovki prison on the Solovetsky Islands in the White Sea. Archbishop Matulionis was allowed to return to Lithuania in a 1933 prisoner exchange, and helped propagate the devotion to the Sacred Heart while working as a military chaplain. He also visited Lithuanian parishes in the United States. 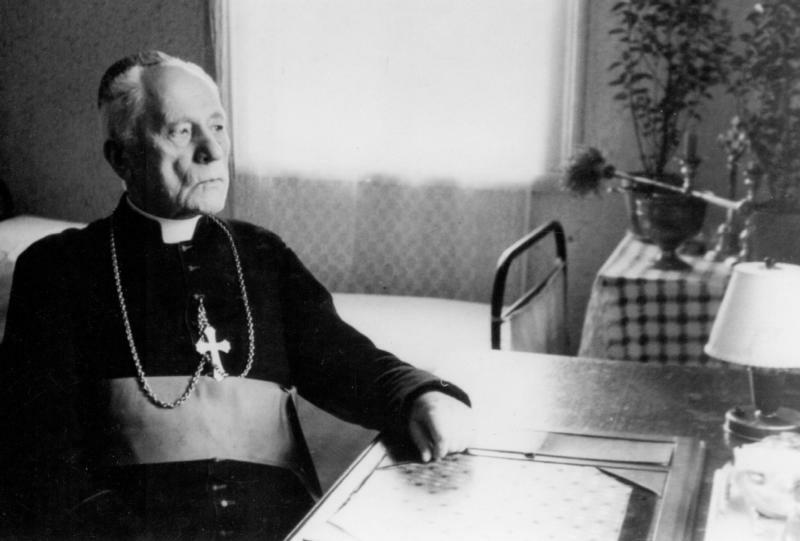 Appointed bishop of Kaisiadorys in 1943, he was arrested in 1946 for refusing to collaborate with Lithuania’s Soviet occupiers and sent to several prisons only resuming episcopal functions secretly when freed in 1956. He was raised to archbishop by Pope John XXIII in 1962, but was refused Soviet permission to attend the Second Vatican Council, and died Aug. 20, 1962 from a lethal injection, which was believed administered by a KGB police nurse following a brutal beating in his apartment. The sainthood cause was launched in 1990 after Lithuania’s independence from Soviet rule, and completed by a papal decree on his martyrdom in December 2016. In an April 13 pastoral message, the Lithuanian bishops’ conference said Archbishop Matulionis had “lived the Easter message” and that he had consistently shown “peace, confidence and goodness,” even to his persecutors. Archbishop Grusas said the martyred prelate had “offered up his sufferings for the conversion of Russia,” while also “moving the church forward” by instructing clergy to remain with their flock even if it meant persecution and exile. He suggested that Archbishop Matulionis invitation from the pope to attend Vatican II appeared to have been the “last straw” for Lithuania’s Soviet rulers. The last Lithuanian to be beatified, Bishop Jerzy Matulewicz-Matulaitis, who lived from 1871 to 1927 and was the founder of the Sisters of the Immaculate Conception, was declared blessed in Rome by St. John Paul II in 1987. The church also is seeking the beatification of Bishop Vincentas Borisevicius, who was shot in 1946 for alleged links with underground fighters, and Archbishop Mecislovas Reinys who died in a Russian prison in 1953. The cases of martyred Catholics have been documented by a governmental Genocide and Resistance Research Center, established in 1997. Archbishop Grusas said, however, that beatifications had been delayed by a lack of canonically trained experts in the Lithuanian church following Soviet rule. He said with recent funding and technical support he hoped the cases of other martyrs could be brought forward. “We’re dealing with recent history, but as we rebuild our church, we’re gaining the resources and expertise we need,” he told CNS.